The Board of East Looe Town Trust are pleased to announce that two new Trustees were appointed to the Board on 11th November. Mr Laurie Tansley moved to Looe in 2011 and built his new home in East Looe. 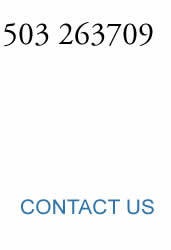 He was Operations Director of a major contractor for 20 years and has a broad knowledge of the construction industry. Mr Tansley said ' I am delighted to join the Board of Trustees and look forward to making an active and positive contribution to the ongoing management of the East Looe Town Trust assets'. As you will have noticed there is extensive scaffolding at the Guild Hall. This has been provided to protect people walking along the public footpath because of deteriorating stonework and the possibility of falling stonework and mortar. This decay of the stonework is due to age and the orientation of the Guildhall which suffers from driving rain, which over the years has weakened the soft Bath stone. Investigations by an expert building conservation company have indicated significant damage has been caused. Much of the masonry has been eroded and the Trust has recognised the potential health and safety ramifications and the need to protect the public. Temporary repairs are being considered and a long term repair plan will be prepared after a detailed survey which is expected to take place in January 2019. The bathing water quality at East Looe’s main beach has been classified Sufficient for the 3rd year in succession. Welcoming the news, East Looe Town Trust, who own and maintain the beach, say they will continue to work with partners to build on the work that has been done to ensure safe bathing water. The Looe Bathing Water Project was set up four years ago when local stakeholders got together with the Environment Agency, South West Water, and Cornwall Council to improve bathing water quality and ensure Looe passed the stringent new standards. The big challenge for the beach is that agricultural run-off from the East and West Looe river catchment area, and in equal measure, urban pollution can reduce water quality following significant rainfall. Millions of pounds have been spent on infrastructure improvements between Liskeard and Looe, and a coordinated campaign has raised public awareness that people really can make the difference. Chairman of the Looe Bathing Water Project, the Mayor Armand Toms said, "Good news, but we have little or no margin for a wet summer next year. That’s why we're campaigning for more infrastructure investment to protect bathing water quality. But everyone can help right now by supporting the campaign to stop all wet wipes, and other things that block the sewage system being flushed." ELTT Vice Chairman, Brian Galipeau said, “Bathers can swim with confidence in the water quality at Looe. A daily pollution risk forecast notice is posted at the beach or is available on-line and as an app. As we head towards the end of the year, it is a time to reflect on the progress and many changes that have taken over the last year and to look forward to what 2019 has in store. At the October Trust meeting, both our existing Chairman, Phil Gibson, and our Vice Chairman, Brian Galipeau, received unanimous support to remain in their roles for another year. 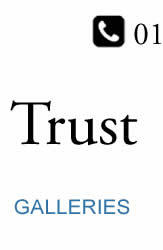 Following a recent advertisement, the Trust hopes to welcome new Trustees to join us in the near future. The Trust welcomed our new Admin Officer, Jane Day, who started in her role on 1st October, who will support the Trust Manager in keeping the Trust running on a day-to-day basis and planning for the future. Trustees were pleased to be able to support the Looe Lions with a £590 donation to insure their new minibus, which provides much needed transport to many people and community groups throughout the year. The Old Guildhall Museum & Gaol has had a very successful year, winning awards for our silver key and for our wonderful team of volunteers, who give so much of their time, ideas, enthusiasm and, frequently, elbow grease, to make our museum and the town’s history come alive: without them the Trust would not be able to keep the museum going. Their efforts have also been rewarded with more visitors than in any previous year coming to see the exhibits and artefacts that tell Looe’s history. We look forward to even more success for the museum in 2019. If you are interested in joining our team of volunteers: whether greeting visitors in the museum itself, or helping research or organise museum items from home, please contact the Trust Office on info@eastlooetowntrust.co.uk or 01503 263709. The ‘New’ Guildhall has had something of a facelift this year, with repairs to our magnificent stained glass windows, repairs to the roof, heating, fire alarm and façade of the Grade II Listed building. We have also installed lights on the Clock Tower, which will be lit to celebrate and commemorate special occasions and festivals. You will be able to see the lights over the Christmas period adding to the illuminations around the town. The Trust hopes to make some progress in the coming year in deciding a use for the now empty Old Lifeboat Station and Watchtower and securing some funding to help repair them. We would welcome letters of support and ideas from the community on these, so if you would like to suggest how we can use them, please contact the Trust Manager. As always, the Trust is donating use of the Town Beach and Rose Garden to Christmas activities to help make Looe a vibrant town at all times of the year. We wish you all a very merry Christmas and a healthy, prosperous 2019! Following a service of Remembrance at Looe Town War Memorial, Mayor Arman Toms led a procession to East Looe seafront where the Pages of the Sea event took place. Inspired by the director Danny Boyle, East Looe beach was among many to be selected across the UK to mark 100 years since the Armistice and the end of the first World War. Artists produced a large image in the sand at low tide of Captain Kenneth Walton Grigson who was killed in action. As the tide came in the sea took the images back into the water. The annual sand sculpture competition has become a popular event for those embarking on the BA Honours Extended Degree Course, as well as for spectators watching the art unfold in Looe. The course accepts students of any age and draws artists from a varied background; this year's cohorts includes a Formula 1 photographer, an ex-nurse and a former mounted policewoman. The East Looe Town Trust (ELTT) awards a £50 cash prize to the team of students which create the best sculpture, and the competition was judged this year by two local creatives, glass artist Sandy Horton and abstract painter James Howe, who worked on the films Blade Runner and Local Hero. One of the winning team, Hazel Hon said ‘I loved watching the sculpures develop from scratches in the sand to works of art’. 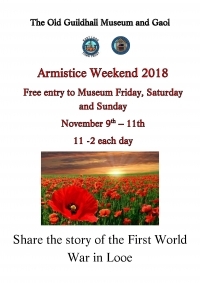 As part of the Armistice day events ELTT has offered the use of East Looe Beach to hold a number of events to commemorate the 100 years since the end of World War 1. These can be found in the poster opposite and there is a web link which provides additional information. The lease offers the premises as seen, exclusive of utilities and business rates, and would be renewable on a rolling basis, while a long term project for the Old Lifeboat Station is developed to ensure the building’s future. Please note, this invitation relates specifically to the Old Lifeboat Station and does not include the Watchtower. 8. Any additional information applicants consider relevant to their proposal. Should you wish to visit the site before submitting a proposal, please contact the Trust Manager on the email or phone number above. Please submit your proposals in writing by Friday 26th October, 2018 to the Trust Manager, via email or to the Trust Offices, Guildhall, Fore Street, Looe PL13 1AA on the details above. At the end of October, there will again be scaffolding on the Guildhall for a couple of weeks. This will be on the East wall, so we can have the last of four lights installed on the clock tower to light it on special occasions and during festivals. We will also remove the mesh from the stained glass windows and do some repairs on the frames so they will be much more visible from inside and out. Our maintenance team will be felling some dead trees on the Wooldown and removing saplings along the Quaker trail, which we will use to put log habitats into that area of woodland to help support more wildlife. Also on the Wooldown, Patrick (Paddy) Saunders from Kernow Ecology has been working throughout the year to encourage more biodiversity in our ‘bee glades’. Where we have cleared areas of much of the bracken, bramble and Old Man’s Beard, we have been creating a rich habitat for biodiversity and seen lots of butterflies and grasshoppers in the longer grass. Our project has had mixed success so far: we have not seen an increase in the numbers of the Long-Horned bee that was the focus of the original plan, but Paddy reported seeing two other rare bees – the Hawksbeard Mining Bee and Red-girdled Mining Bee. Paddy has also reported a great deal of natural regeneration of interesting fauna in the glades and in the meadow enough to make a good habitat long-term without the need for additional wildflower seeding. Nevertheless, we have plans to plant further Meadow Vetchling and Everlasting Pea in the glades to specifically support the Long-Horned bees. We will continue to monitor the impact of this project and hope to see a positive impact on wildlife in future. Finally, our museum recently received some good news – the Volunteer Manager, Petra Stephenson, successfully applied to the Small Grant, Big Investment Fund and the museum will receive £500 to enable us to put uv film on the downstairs windows. Currently, we have uv protection upstairs, but the artefacts downstairs – particularly those displayed on the window sills – have no protection from the damage caused by uv rays in sunlight. We will have a special film applied to the window panes, which will filter out the uv, so our artefacts are protected in future. We look forward to a busy autumn and winter – and hope the weather will be kind to help us with our plans.